Valdosta State Prison is located in Lowndes county Georgia. It is a closed custody facility that houses approximately 1,312 adult males. This facility has work programs that allow some inmates to work in a chemical plant that manufactures cleaning supplies for use in many of the facilities in Georgia. Inmates can also work in landscaping, laundry, cafeteria, and in transportation and maintenance. Offenders at Valdosta State Prison can take educational courses to learn to read, get an adult basic education and earn a GED. Substance abuse treatment is available for all inmates who need it. Vocational skills that inmates can learn include barbering, culinary arts, painting, clerical work, and custodial skills. 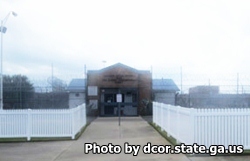 Visitation for General Population inmates occurs on Saturdays, Sundays, and Holidays from 9am-3pm. Tier inmates have visitation on Mondays and Wednesdays from 8:30am-2:30pm but the visit must be scheduled at least 24 hours in advance.